Stripping paint from a wooden door – or windows for that matter – is a time-consuming and messy job, so it’s important to make sure the wood is worthy of the effort before you get started. If inferior timber was used originally, or if it’s an unsightly mass of worm-holes, it might not be a good idea to strip paint from the door. If you decide your wood is worth the effort, follow this step-by-step guide where we show you how to strip paint from a wood door. 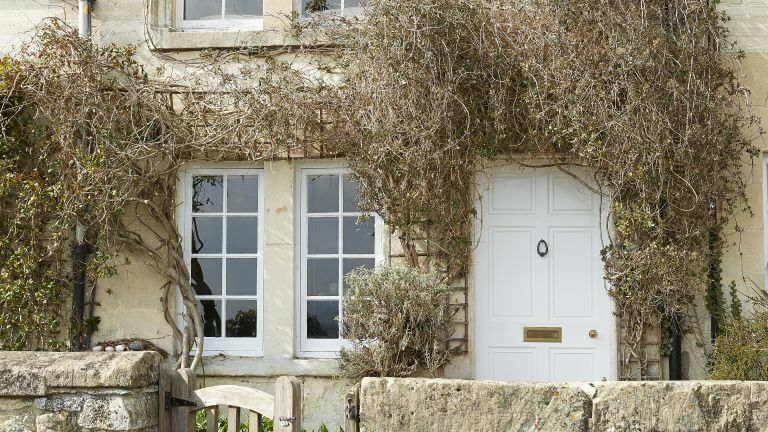 For more information about painting your house inside and out, see our expert advice. Which technique to use for stripping paint from a door? Some people favour a hot-air gun to strip paint; use it just enough to soften but not burn the paint. Keep the thermostat set below 450°C to avoid giving off fumes. Gloss paint manufactured before the mid 1960s contained a small quantity of lead, so if you’re unsure (you can buy a lead testing kit), use a paint stripping method that doesn’t create dust. Once the main job is done, don’t use sandpaper to get rid of the residue; instead moisten the surface and smooth it with wet waterproof abrasive paper. Before you start to strip paint from a wooden door, carry out a test on a small area of the wood. At the top apply a thick layer of stripper tapering down to a thinner layer at the bottom. Cover and leave. You will then be able to judge how thickly you need to apply the product and how long you will need to leave it. Once you know how thickly the paint stripper must be applied in order to lift off all the layers, the next step to successfully strip paint from a wood door is to spread it over the entire door. A wide, slightly flexible scraper is ideal for the job. Be sure to clear the surroundings first, and protect the floor with a plastic sheet. Never strip paint without wearing heavy duty work gloves. Cover the stripper with clingfilm or bin liners to keep it moist. The paste will slowly dissolve the paint to a water-soluble residue. This could take between 15 minutes to several days, depending on the thickness of the paint layers. One application can dissolve a very thick layer of paint if given enough time to do so. You’ll know the paste has done its job when you take off the plastic covering and the softened paint peels away from the door. Immediately stuff the plastic and dissolved paint safely in a bin bag and tie the top just in case there’s any old lead in there. Keep children and animals away from the area during and after stripping paint. Once the bulk of the paint stripper and dissolved paint has been removed, residual paint can be cleaned away with a scrubbing brush and warm water. Wipe away loosened paint with a sponge. When you’ve finished, mop up surplus water with an old towel, otherwise it may raise the grain of the wood. Wait until the wood is completely dry. If efflorescence has occurred – white crystalline salty deposits – brush them off and rinse the surface again. Neutralise the wood by sponging it down with a solution of one part white vinegar to three parts water. Allow to dry thoroughly before applying any finishes. Tip: After stripping paint with a chemical stripper, you must always neutralise the wood with white spirit or white vinegar depending on the product. Forget to do this and you may find a bloom developing under the finish, or a subsequent coat of paint or varnish will fail to bond. Once you’ve made the effort to strip paint from the door and return it to its beautiful natural finish, you may find the door furniture no longer does it justice. Dip medium grade steel wool in oil and rub away rust deposits; this will also protect it from future corrosion. A few drops of oil on the hinges will put paid to squeaks and creaks. Tighten any loose screws. Smooth the door with fine grade glasspaper following the grain. To nourish the wood and protect it from the drying effect of central heating apply a finish of liquid beeswax by brush or cloth. Leave for six hours and apply more coats as necessary. Once dry buff with a cotton cloth and for extra shine apply wax polish. Looking for more renovation tips and tricks?